Milling work taking place on Bankhead road surface at night. New Albany, MS- In spite of rain delays, the work to re-pave Bankhead Street (Highway 178) is progressing with “milling” of the old surface being done at night. 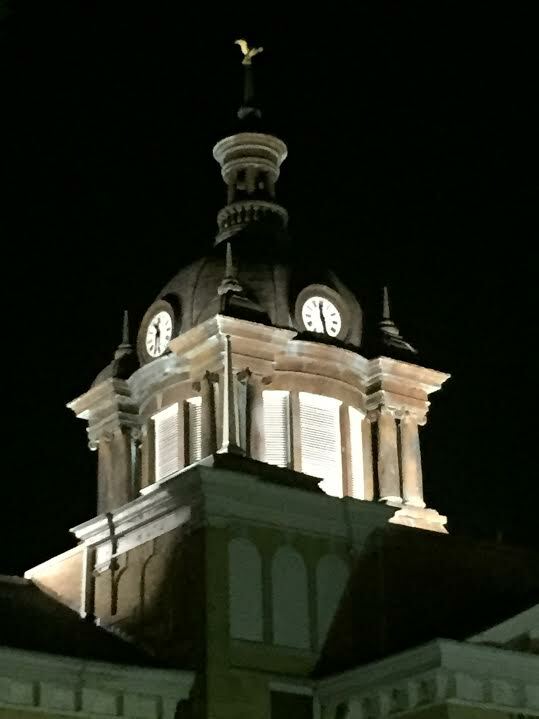 Union County Courthouse clock at 11:30 pm, at which time road work was well under way. APAC of Mississippi, the contractor retained by the Mississippi Department of Transportation (MDOT), started work Monday, August 15, on re-paving Bankhead from Highway 15 to the western city limits of New Albany. The first step is removing about one-and-one-half inches (1.5 in.) of the old street surface in a process known as milling. Several periods of rain had delayed the milling operation for about seven hours by the time the work shift ended early Thursday morning, August 18th. The milling work is being done at night to minimize inconvenience to motorists. Much of the gravel and asphalt material “milled” from the street surface will be recycled in future paving operations. It is expected that the work will be complete–milling finished, paving done, and new stripes painted–within the first couple of weeks of September. Our most recent listing is as one of "21 Small Towns You Should Visit on Your Next American Road Trip"